After shaking up its range, the South Korean company is taking the fight to its major rivals. IT’S BEEN AN interesting few months for Samsung. After the success of its S7 range, receiving praise both critically and commercially, the company has hit a good run of form. 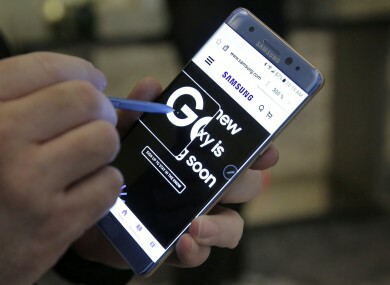 Its head of mobile for UK & Ireland, Conor Pierce said it’s been “a long, hard battle” but is gearing up for the next phase, the release of the Note 7 which has also received much praise from critics. Its decision to shake up its flagship range is beginning to pay off, and Pierce says it started 18 months ago when it claims started listening to feedback and criticisms. “The S6 was the beginning of the era and the turnaround and really listening to people about what they want,” he said. “I genuinely believe the tide is turning for Samsung. It’s been a long, hard battle but an exciting one”. Whether you agree with that or not, you can see where the optimism is coming from. For the past few years, the iPhone has been the device to beat since it was first launched in 2007. Its influence means it’s the first thing that comes to mind whenever the word smartphone is mentioned, and Apple’s reputation (as well as its hardware and software standards) helped it dominate the market. But with rumours suggesting that next month’s iPhone announcement will follow a similar beat to the iPhone 6 and 6s, it gives Samsung a greater opportunity to shine. While it’s been the last few months where Samsung has really hit its stride, Pierce says it didn’t just start with the S6, it’s been experimenting for years. It’s just the payoff has just started. “We’ve been innovating for generations…$40 million a day is spent in R&D (Research and Development) and that’s why we create categories like the phablet, bringing VR to the market, smartwatches, the IconX earbuds (wireless earbuds) and the 360 camera”. So what we’re trying to do is not just talk about one device and all the features that are within it, we’re also talking about… the ecosystem, what you can do, [and say] this is what we’re trying to build. And part of the success of the S7 can be put down to it offering the Gear VR for free, its mobile virtual reality headset, alongside the S7 range and Note 7. Of the 500,000 Gear VR devices owned in Europe, half of those are owned by UK and Ireland – Pierce declined to reveal figures regarding sales of the S7 or pre-orders for the Note 7 – but as far as sweeteners go, it’s easily one of the better ones out there. So how does it expect to beat Apple at its own game? By building an “emotional connection” with people, something that Pierce says “makes all the difference”. “To continue our focus on winning in premium, we need to make sure we have a very compelling brand story that connects with people authentically. Secondly continue to innovate but not for the sake of innovation, meaningful innovation that really brings value to people,” he said. Email “It's been a 'long, hard battle' but Samsung feels its efforts are really paying off”. Feedback on “It's been a 'long, hard battle' but Samsung feels its efforts are really paying off”.